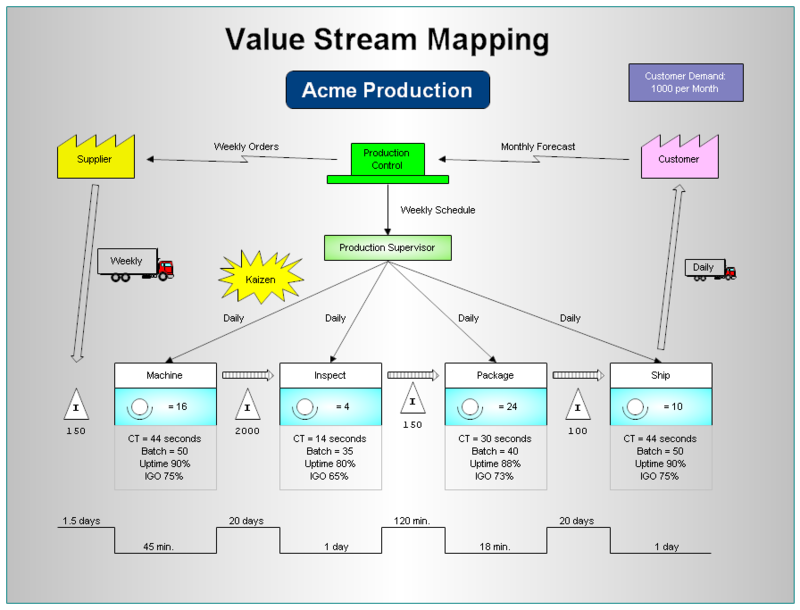 Description Value Stream Mapping is used to analyze the flow of materials and information currently required to bring a product or service to a consumer. RFFlow includes a stencil for Value Stream Mapping. It includes all the commonly used shapes. Different companies use slightly different shapes, so there is some duplication. If there are any shapes that we missed, please contact us so we can add it in the next release of RFFlow. Instructions First download the free trial version of RFFlow. It will allow you to open any chart and make modifications. Once RFFlow is installed, you can open the above chart in RFFlow by clicking on value_stream_1.flo. From there you can zoom in, edit, and print this sample chart. It is often easier to modify an existing chart than to draw it from scratch. Scroll to almost the end of the stencils and click the Value Stream Mapping stencil and then click the Add Stencil button.